Editor's Note: This post was originally published in July 2013 and has been revamped and updated for accuracy. We’ll be the first to admit it, we love sweets! Bad news, sweets don’t love us back. So how do you find a healthy balance between satisfying your sweet tooth without totally sabotaging your diet? First you should find out what’s triggering your hankerings for sugar. Before you pick up that candy bar, pause for a second and ask yourself: “Am I really hungry?” Often times a sugary craving hits when you’re feeling bored, antsy and all you really need is a brisk walk. 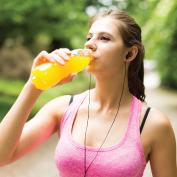 Maybe you're feeling low on energy - try these quick and healthy energy boosters. If you really are hungry and craving something sweet, try one of these tasty (and less guilt-ridden) substitutes below. Ready to take your healthy eating to the next level? Try our Healthy Go-Tos Grocery List. Ice Cream: try frozen yogurt. 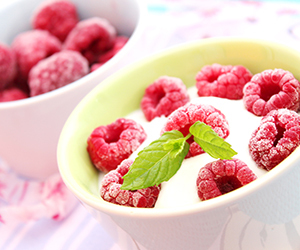 This is a smarter choice than ice cream with less fat and calories per serving. There’s so many new varieties and flavors on the market now, you’re sure to find a new favorite. Candy bar: try traditional dark chocolate. The heart healthy darker version is better for you than typical milk chocolate. Sweet and Salty: try trail mix. Toss nuts, seeds, dried fruit, dark chocolate chips, and whole wheat cereal together for a sweet snack loaded with good for you nutrients. 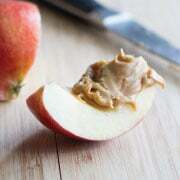 If you're looking for something fun for your littles, try these healthy snacks for kids on the go. Sweet and Crunchy: try kettle corn which is sweeter than regular corn and way less fat than buttered. Plus you’re getting a healthy dose of fiber. Sprinkle with cinnamon for a spicier version. Brownies: try low fat chocolate pudding instead. We know nothing beats homemade brownies, but you’ll be glad you made this easy swap next time you step on the scale. Mocha: try either a sugar free/skim milk option, or even better, choose a sweetened iced tea instead. Green tea is one of our favorites as it has more antioxidants than black tea. Cupcakes: try angel food cake. It’s surprisingly low in calories, but still light and fluffy like your favorite mini treat. Cookies: try a low fat granola bar. Still chewy and delicious, but not so hard on the waistline. Or one of these high-fiber snacks. An occasional decadent serving is okay and there will be times when you will (and should) indulge in the real deals. But making these healthy and simple switch-ups during the week will pay off big in the battle against the bulge.